It’s been a weekend that could have easily supported a blog post a day. But I’m lazy and I really was hoping to get a new photo or two printed before posting…but other things happened and I still haven’t made any new prints. So here’s the updates instead! This one will be long with a lot of photos…no teaser photo for the front though. Being right ain’t no fun sometimes. Yeah, I admit I like being right. Most of the time. But sometimes I really wish I wasn’t right about something. 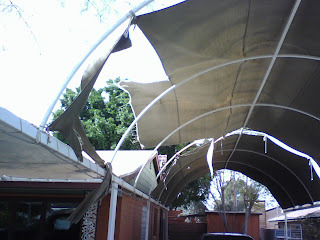 Like the prediction I made when we bought this house that “Those carport tarps won’t last a year” despite the sellers assurance that “They have a 7 year warranty and are only a year or so old.” Which of course means – it happened again. Read on for more details, more photos, and something completely different. I kind of knew it was going to happen. I was never very happy with the choice of material the previous owner used for the carport, he claims it was UV rated but it’s only a few years old and already it’s badly faded and I could tell it was getting weak. In fact just yesterday I was looking at some tears that had started around the grommets in it so I knew it wouldn’t be lasting forever. I’d like to go out and take it down before it gets any worse…but with 45MPH gusts predicted (Though I think they’re bigger based on how much our trees are swaying!) 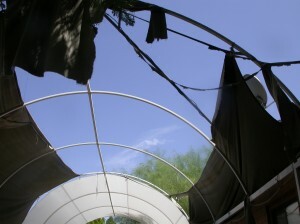 I don’t think it would be a wise idea for me to go outside and play with a large sail in high winds on top of a ladder. Since it’s a total loss at this point anyway I’ll just let the wind have it’s way and start thinking about how to deal with it. I’d love to make something that could be rolled back for occasions where we want some sun…or when the wind gets like this 😀 But for now I’m just hoping we can find something we can afford as a replacement. I’m hoping my old boss Gwyn at Racecraft can help me get some vinyl impregnated awning fabric like she uses and help me sew it up to be the right size. Going to have to make some phone calls this week it looks like!